Warning: the following article or section contains major spoilers about the final boss in Pikmin. The Emperor Bulblax (ダイオウデメマダラ?, lit. : "Bug-eyed Spotted Great King") is the second largest known species of the Grub-dog family right after the Empress Bulblax. It serves as the final boss in the first Pikmin game, dropping the last ship part needed to complete the game. The Emperor Bulblax is different than most members of the Grub-dog family as it has a sludgy, melted appearance, smaller eyes, and a more flexible tongue. Moss grows upon its thick hide, giving its body a greenish color and serving as camouflage, and in the first game and Hey! Pikmin, it even bears tall mushrooms and fern-like stems. Although these growths are missing in Pikmin 2, they are replaced by what appears to be rocks embedded into its back. This beast usually hides in the ground to ambush prey, catching them with its long, sticky tongue. Its soft face is its only weak point to attack, but since it doesn't discriminate much when eating things, it can be led to swallow something a bit less tasteful than Pikmin – namely, bomb-rocks. It varies a bit between the three games, being a lot weaker and smaller in Pikmin 2, even having less health than a Fiery Bulblax – an enemy which is not considered a boss. In addition, it has the least health of any boss in the game. In Hey! Pikmin, it is normally unreachable, and needs to be coaxed into eating a bomb rock before any damage can be done. ↑ The one in Bulblax Kingdom has 1800 HP. The Emperor Bulblax is the final boss in Pikmin. It lies buried in the ground at The Final Trial inside the center of the sandy arena north of the landing site, visible only by the mossy growth on its back protruding from the ground. When approached, the Bulblax will rear up and roar, knocking Olimar and the Pikmin back, and will then proceed to attack by licking Pikmin into its mouth with a large purple tongue. If Pikmin are latched onto it or located under it, it will jump in order to shake off any Pikmin on it, and crush any Pikmin underneath. Once it reaches beneath half of its maximum health, it will add a new attack to its arsenal: jumping high up into the air, and eventually dropping onto the army of Pikmin. One can tell when it is willing to use its tongue by observing its salivation: if it's drooling, that means it will soon attack by using its tongue, gobbling up any Pikmin in front of it. The tongue is large and has no limit on the amount of deaths it can cause. When it's in a jumping phase, one can foresee a jump by knowing that its eyes widen just before it hops. Once defeated, the Emperor Bulblax will go into a particularly long death animation, where it writhes around while drooling and appears to be sucked underground, leaving behind the Secret Safe and five randomly colored 5-pellets. It's usually a good idea to devote a single day to removing obstacles and clearing the path, and then deal with the Bulblax the following day, since the battle itself can often be time-consuming. The Bulblax must be defeated in a single day, since any damage done on one day will not carry over, and if the day is ended before it is killed, then it will be at full health the next day. However, experienced players can cover all of The Final Trial in a single day, which is a must for a 6 day run. The Emperor Bulblax's artwork from Pikmin 2. In Pikmin 2, these beasts are much weaker, most likely due to their diminished size. They are found only underground, with only their eyes exposed as a form of camouflage, but emerge in the same manner, sans the leader knockback. The hide is not very mossy, but the backside of the beast is still green and slimy, as well as invulnerable. This could mean that the Pikmin 2 versions may just be younger than the one in Pikmin. They still eat the now huge bomb-rocks, but must be coaxed into doing so instead, seeing as Yellow Pikmin no longer have the ability to handle those explosive objects. All other abilities are retained, except for the jumping phase. It is replaced by a roaring phase when the Bulblax is about a quarter until death; it will make other Bulblaxes join the fight and drag existing Mitites out of the ground, which will scare the Pikmin into a frenzy. Luckily, unlike in the previous game, an Emperor Bulblax can only eat a maximum of 9 Pikmin at a time. When it dies, the Bulblax spins around and roars, whipping gobs of saliva everywhere until it shrinks down to a pre-determined size for easier carrying. This creature is found on the last sublevel (7) of the Bulblax Kingdom, where it is larger and stronger than normal; two are found on sublevel 4 of the Cavern of Chaos and sublevel 10 of the Hole of Heroes; and three are in the Emperor's Realm in Challenge Mode. The creature never leaves its central spot in the arena, although it can bury down. When the battle begins, the boss will idle for a bit, then start turning towards Captain Olimar. Once it is facing him, it will stop, ready a bite for a few seconds, and then lunge in, chomping at the floor. While it is getting ready to chomp, it won't rotate any further, giving Olimar and the Pikmin time to escape the area of attack. After the bite, it will simply repeat the cycle. Captain Olimar will take damage from this bite and be launched away, and if it manages to get Pikmin, it will gobble them up, up to a maximum of four. Any Pikmin that are thrown at it while its face is in reach because of a bite will just bounce back. If the Emperor Bulblax chomps a bomb rock on the floor, it will chew on it until it blows up in its mouth. This causes a small amount of damage. Stunned, it will topple forward onto the floor, and stay there motionless for some seconds. Eventually, it will jump back up, and start burrowing into the ground. When it does this, two Crumbugs pop out from behind the grass. After some seconds, the boss will spring back out from underneath the ground and restart the cycle. While the creature is lying down, unconscious from the bomb blast, Pikmin can be thrown at its face to damage it further. To note is that when the boss collapses onto the floor, it can harm Olimar if he's underneath, but Pikmin will merely be shoved away, and also that if it manages to eat two bomb rocks, the resulting damage and stun time will be the same as if it caught just one. Amusingly, if the chomp attack captures any Crumbugs, the Emperor Bulblax will actually chew on them and eat them. If its health reaches two thirds when it is being attacked by the Pikmin, it will jump up and shake them off, and will then lick its lips twice. This signals the next attack: a horizontal tongue swipe in front of it. Any Pikmin caught by this attack, up to four, will get killed right away, and Olimar can also take damage from it; bomb rocks will be ignored by this attack. From this point on, its attack pattern will also change: after it turns to face Olimar, it will instead start shaking, and then jump, and in mid-air, quickly turn to face Olimar's new position. After this, it will also perform the lip licking and tongue swiping from before, and only after that does it perform the chomp attack and restart the cycle. When it starts shaking to jump, two Sparrowheads appear from behind it, and before long, they will get near Olimar, one on each side. They will swoop down while the boss is licking its lips. When its health reaches the final third, it will once again jump up, shaking the Pikmin off, perform the lick attack, and will burrow down and then unburrow. From here on out, four Sparrowheads will appear instead of two, with two on each side. It can be noted that bomb rock explosions on its face will cause no damage. For unknown reasons, the boss can actually miss a bomb rock that is right in front of it and not eat it. This could be due to the way the physics work in this particular area, since the movement, hitboxes, etc. are all adjusted to rotate around a circular path. Particularly: Confirm that "Pikmin can also be thrown into its mouth while it is preparing to stick out its tongue and still give a stun-like effect." claim. When you enter the sandy arena, it is best to sneak around the beast, and take down the bramble wall behind it. Once destroyed, there will be fifteen bomb-rocks available to use, found inside the strange pipe structures. Give them to your Yellow Pikmin, and dismiss them in an open area, where you can easily select one from the group. Bring your large army of Red Pikmin along with you as well, since they are the most powerful Pikmin. Awaken the beast by throwing a Pikmin onto the moss patch, and wait for it to ready its tongue for an attack. With proper timing, throw a bomb-rock carrying Pikmin in front of it so that it will throw the rock into its mouth, stunning the Bulblax for a period of time. If the Pikmin gets consumed with the bomb rock, the stun will not last as long, so be careful. Once stunned, throw your group of Red Pikmin onto the Emperor Bulblax's face. Throwing Pikmin onto its back will bounce them right back off. When the Bulblax gets back up, it will hop into the air to shake off Pikmin. If there are no Pikmin under it, wait until it is in the air before your call your Pikmin back, to maximize damage; otherwise, call them back before it jumps so that no Pikmin are lost. Keep repeating this process until the final boss has reached half health, where it will begin using its high-jumping attack. Now you will have to be a little more cautious. You can tell whether or not the Emperor Bulblax will jump into the air if it is not drooling when it sees your Pikmin. If you see its eyes go wide open, flee from the arena, as that is an indicator that it is about to jump into the sky. If the Bulblax is drooling, proceed to use the strategy used before, and eventually the Emperor Bulblax will be defeated. Pikmin can also be thrown into its mouth while it is preparing to stick out its tongue and still give a stun-like effect. Once the bomb-rocks explode, it/they will stun the Bulblax (the more bomb-rocks, the longer the stun), providing a good time to toss as many Red Pikmin, as they are stronger than other Pikmin, as possible onto its face. Doing this repeatedly will have it beaten easily. A slightly faster method would be to leave a Yellow Pikmin with a bomb-rock behind it when it has turned around. All of the Red Pikmin (which should be able to amount to 85 or so) then swarm the Bulblax as soon as it notices the Yellow Pikmin, as attacking its legs also hurts it. However, careful timing is necessary when calling back the Pikmin. The stomping attack will be especially dangerous, as the Pikmin are right beneath the creature, and the attack can be initiated very quickly. It is also possible to beat the Bulblax by throwing Pikmin onto its head when it is distracted. It is more risky than using bomb-rocks, but much more simple and possibly the only feasible option for people trying to do a zero-death run. In New Play Control! Pikmin, the only ways to have Yellow Pikmin stun the enemy with a bomb-rock is to let the Pikmin be eaten, or to time the throw correctly so that the bomb-carrying Pikmin throws the bomb into the Bulblax's open mouth, which will stun it for a longer duration that allowing it to eat the Pikmin. In Pikmin, the beast cannot be damaged with Captain Olimar's punch. One of the fastest strategies to beating it in Pikmin for the GameCube is to gather several bomb-rocks, place the carrier Pikmin near it, and when it is readying to eat them, call them back so that they drop the bombs on the floor. The boss will instead gulp on the bomb-rocks and become paralyzed for a considerable amount of time. Afterwards, quickly throw your Pikmin army at its face path (starting with the Reds). With enough speed, the creature should be defeated in a single cycle. This strategy will not work in New Play Control! Pikmin. Bring a small group of Purple Pikmin (10 or more) and toss them right in between the eyes; in no time at all, the beast will be defeated. If you don't have enough, use Red Pikmin and other Pikmin types, but be prepared to use sprays in case your numbers dwindle. One way to kill it without Purple Pikmin is to bring a group of 10 White Pikmin, as they are fast, or any of the original Pikmin, to fight and throw all on the Bulblax's face and the battle will be over in from 30 seconds to about a minute. Where bomb-rocks are available, making it eat them is the safest strategy, and if the beast is underwater, the only strategy. By standing near a bomb-rock and running away before the boss strikes with its tongue, it is possible to make it eat the explosive instead, causing a high amount of damage. This method can be a bit time-consuming, however. In Pikmin 2, it is possible to kill an Emperor Bulblax without Pikmin. The first method is to lure the Bulblax into eating bomb-rocks, should there be any nearby, until it succumbs to the explosions. Another is to punch it while petrified. However, this requires about 50 sprays under non-stop punching. More damage can be dealt with the Rocket Fist upgrade; using said upgrade would require twenty less sprays. It is one of the only two bosses in the game the leaders can hit, the other being the Waterwraith. By far, the quickest method is to rapidly throw Purple Pikmin at it, even when buried. If the player is fast enough, it'll have suffered almost fatal damage by the time it is ready to fight, and should succumb soon after. Right when the battle starts, start moving either right or left to grab a bomb rock. The boss will be turning to keep up with you as you move. You should have enough time to grab a bomb rock. When you see the Emperor Bulblax start to growl, throw the bomb rock at the center of its shadow on the floor, and run in the opposite direction. If it didn't catch the bomb rock, hurry to grab another one on the opposite end and try again. If it caught it, stand nearby, but not under the shadow, since that will just result in you getting knocked back when the boss collapses. As soon as it does, throw Pikmin at its face. You should bring its health down to two thirds, so when you hear the Pikmin squeal, whistle them and start running to the other corner of the arena. When the Emperor Bulblax burrows down, two Crumbugs will appear, so get ready to throw Pikmin. You can start throwing Pikmin at them while they are in mid-air for an easy kill. To take out Crumbugs on the floor, try to be at a medium distance from it, and aim a bit closer to you then you normally would, to compensate for the angled throw trajectory in this area. With its health at two thirds, its attack pattern will change. Go to one of the corners of the arena, and grab a bomb rock while you're there, if you can. Make sure you're flush to a corner when it starts shaking with its snout low, since that means it will jump up to readjust its angle, and end up facing near the corner. As soon as it lands from the jump, run to the opposite corner, so you can escape both the tongue swipe attack and the Sparrowheads that will appear. Keep in mind that a Sparrowhead can still come your way, and it is possible for it to still be in attack mode, so if you see one, take it out before it touches your group of Pikmin. You can also take the chance that you're in a corner to get another bomb rock. Eventually, the boss will face you again, and you can throw another bomb rock at the floor. When its health reaches the last third, the only change will be that four Sparrowheads will appear instead of two. Repeat the process until the boss is dead. If you want to complete the battle quickly and don't want to risk the Emperor Bulblax missing a bomb rock, you can try collecting two bomb rocks whenever possible, and when the beast is readying its chomp attack, place both bombs, in slightly different positions. This vastly increases the chances of one being snatched. Also, to note is that the creature cannot be coaxed into chomping one of the bomb rock generators, as it will not reach them. The mossy growth visible when the creature is buried in Pikmin is a separate entity. The Emperor Bulblax appears as one of the spirits in Super Smash Bros. Ultimate's Spirits mode. It appears as a puppet fighter of a giant King K. Rool, with the attributes of making the enemy hard to launch or make flinch (super armor) and forcing the match into a stamina-based mode as opposed to the typical damage-based mode. The Emperor Bulblax is the largest male member of the grub-dog family, which earned it the title of emperor. The reason for it to be called Bulblax instead of Bulborb is unknown, but it could be due to the creature being considerably different from common grub-dogs. In Japan, it is given the name ダイオウデメマダラ?, where ダイオウ? means "great king", デメ? means "bug-eyed", and マダラ? means "spots". In the scientific name, Oculus supremus, Oculus is the Bulborb genus, and supremus means "supreme" in Latin. The creature's internal name in both games refers to it as a king – the king of the Chappy (Bulborbs) – with the name king in Pikmin and kingchappy in the sequel. The Bulblax licking the ground. Stunning the Bulblax with a bomb-rock. Calling Pikmin back to safety. The Emperor Bulblax being stunned, and attacked in Pikmin. Emperor Bulblax hiding itself in Pikmin. Emperor Bulblax in the enemy reel from Pikmin. The Emperor Bulblax in the Piklopedia from Pikmin 2. An Emperor Bulblax being defeated in the last sublevel of the Bulblax Kingdom. An Emperor Bulblax in sublevel 4 of the Cavern of Chaos. An Emperor Bulblax in Pikmin 2. Note the smaller size compared to Pikmin. The Emperor Bulblax hiding in the ground. The Emperor Bulblax lashing out its tongue. The Emperor Bulblax roaring. Notice the other Emperor Bulblax in the back waking up. The Emperor Bulblax when defeated. The creature's e-card, #13 (19th yellow card). The Emperor Bulblax as it appears in Hey! Pikmin. The starting location of The Last Lair. The creature can be seen in the background. Reaction after missing an attack. As seen in the June 2017 trailer. To do: Expand on the Cavern of Chaos glitch and move it to the glitches page. Captain Olimar's notes for the Emperor Bulblax say that moss and plants grow on its back in rainy seasons. In Pikmin 2, these beasts only appear in caves, which, added with the presumably younger age, might explain why so much moss is absent on the beast's back, as the moss only has the cave's moisture to grow with. The Emperor Bulblax's attacks and appearance may be based off of the real-life frog. They both bury or immerse themselves with only their eyes and backs exposed while hunting, use their long sticky tongues to catch small things passing by (in this case, the Pikmin), they can both jump higher than most other creatures, both look similar in appearances, and both make loud croaking noises. The Emperor Bulblax is one of three bosses in Pikmin to reappear in Pikmin 2, alongside Beady Long Legs and the Burrowing Snagret. 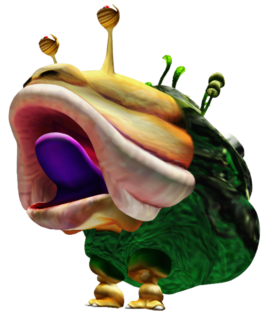 The Emperor Bulblax is one of the three creatures in the whole Pikmin series to have plant-life growing on the beast, the other two being the Quaggled Mireclops and the Flatterchuck. In the Cavern of Chaos, there is a sublevel with a pond and 2 Emperor Bulblaxes. Go onto the smallest island after waking one up. It will attempt to use its tongue, only it will not wave, just poke out and go back in its mouth. Walk away and it freezes but if you go back on the island it keeps playing the walking animation but does not go anywhere. A rough copy of the Emperor Bulblax from Pikmin 2 exists in unused files in Pikmin 3. This page was last edited on March 3, 2019, at 09:36.